Best Wedding DJ I’ve Every Heard! Best wedding DJ I’ve ever heard…and it was for my wedding! Ben and his team are super good. The wife and I received a ton of compliments about the music and mood. Quite a few people said to me “A lot of weddings I’ve been to are usually pretty boring but your guys’ wedding was so much fun”. I attribute a lot of this to the awesomeness of the DJ. Music was great – they played exactly what we asked for and really set a great tone for the night. They were extremely nice people from the first time we spoke to them until even after the wedding. Very easy to work with and you could really sense the passion they have. 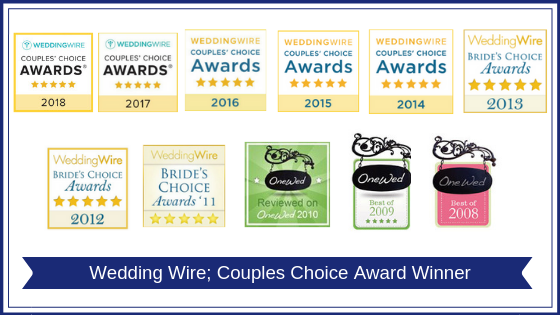 I don’t write a lot of reviews, but they definitely deserve the praise and you’ll be lucky to have them at your wedding. For our wedding reception on September 17, we worked with Ben of Create Excitement. Ben was great to work with in the planning phase and he did an excellent job as our DJ during the event. Our guests had a lot of fun dancing because Ben was able to set the tempo of the evening really well. In the planning phase, Ben was highly responsive. He worked with us to select music for our reception and suggested songs to play at special moments. He reviewed our song choices and made suggestions based on his experience. Ben freely shared his recommendations and was always open to searching for and listening to all of the songs that we suggested as possible plays. Closer to the event, we had a few phone conferences with Ben to iron out all of the final details and that really helped settle some of the pre-wedding stress. Ben also provided us with uplighting for our reception. He provided us with options and sent us example videos so that we could see how the lighting would look in a room. The lighting for our reception was so beautiful, looks great in pictures and beautifully set the mood that we were seeking. Ben’s interaction with our guests at the reception was always professional and, as per our request, he didn’t create a show, rather, he let the musical selections motivate the guests. In the occasions where Ben engaged our guests, he always did so in a sophisticated way, never overly effusive or tacky. The prices for Create Excitement are easily accessible on the website. This made it easy for us to determine which of the many available services fit within our budget. There were never any surprises or fee upcharge for any of the elements that we selected. This made our experience with Ben and Create Excitement even more positive. We would definitely recommend Ben and Create Excitement to our friends and family. I have reviewed Create Excitement in the past from the stand point of having had the pleasure of working with them at mutual events. My review stated: They all are true professionals that really know how to get your party going! Not only Create Excitement.. but indeed Creative Excitement!! They make sure that you know they really care about you and your event from meeting with you in person, to personal phone calls answering any questions that may arise, to their interactive website for planning and customizing your package to be exactly what YOU want it to be. I have since hired them personally for our daughter’s wedding. Both Ginette & Ben were there to run the show. My guests and I could not have been more impressed! They truly are a wonderful team! Their attention to detail is amazing. Our daughter and her husband to be were able to go online to choose songs to completely customize how their reception would go. Ben & Ginette have a wonderful form to fill out that helps you know the order of things that typically happen and yet are totally open to your own creative ideas as well. Nothing will be overlooked or forgotten! Their selection of music is vast to say the least and if they don’t have a song you want (highly doubtful) they will make sure to get it for you! I could go on and on about the lighting they brought.. Ben’s interaction with the guests on the dance floor, etc. etc. If you want the best, most reliable & enjoyable party experience you can have.. these are the people to hire! Adam and I got married on May 21st at the Mill in Spring Lake. Ben provided the music for the ceremony, cocktail hour and reception. Everything was perfect. I am sure this has to do with all of the time and attention Ben put into making sure that everything was just how we wanted it to be. I was a bit worried at first because our wedding was in the daytime that people would not want to dance as much, but Ben made sure that everyone was out there for pretty much the entire reception. Thanks to Ben and the Create Excitement team for making our day better than I could have expected! My wife and I used Create Excitement for our wedding on June 10th. We were assigned DJ Adam. Adam and I spoke once a few days prior to the event and I believe that my wife spoke to him about three times. I was apprehensive because I had never seen his work and all too often you attend an event and the music is too loud for the room and the DJ never turns it down enough to speak to your table mates during dinner and you end never being able to have any type of a conversation. I WAS SO HAPPY WITH ADAM! I told him I wanted soft music during dinner and that is what we got. Excellent. It made the event and then in-between courses he pumped it up and got people out on the floor and as the next course was served he toned it down and then when that was over he pumped it up. All of my guests danced and ate and laughed and had a great time. I can’t tell you how many emails we have received telling us what a great time everyone had. Do yourself a favor and request Adam. Tell him exactly what you want and that is exactly what you will get. If it isn’t it’s because you didn’t tell him what you wanted. Great job Adam thank from the both of us! We cannot say enough good things about Ben and Chris’s phenomenal work at our wedding (and throughout the entire planning process!). Leading up to the wedding Ben was so on top of his communication with us, and we never had to reach out to him or remind him to do anything– he was always 3 steps ahead. We felt that he did such an amazing job at the reception, which was reinforced by all the compliments we have been receiving from our guests since. He did a fabulous job of keeping the night going and knowing exactly what people needed and when. He listened to every single request we had and helped turn our dream wedding into a reality. We cannot thank Ben enough and would recommend him highly to anyone looking for a wonderful DJ! As soon as my husband and I met Ben, we knew that our wedding music would be phenomenal. There are so many DJ services available, but several things set Ben and Create Excitement apart. First, he is so flexible and easy to communicate with, which is so important while planning a wedding. He is also the most professional vendor I’ve worked with. The package we chose was reasonable, and we got more than our money’s worth. But most importantly, Ben worked SO hard with us to make sure our music was perfect for our wedding. My husband and I are music fanatics and wanted to incorporate some offbeat music into our wedding, which Ben did seamlessly. From the ceremony music to the last song at the reception, the music was absolutely perfect. Our guests really enjoyed the music- they danced all day! My husband and I wanted to have a big party to celebrate our marriage- Ben was one of the reasons that we were able to do it so successfully. He is amazing. We had a backyard wedding with about 200 guests. Ben’s services had everyone on the dance floor the entire evening. Thanks, Ben! Ben was awesome at helping us plan the music as well as our photo montage for our big day! From the first time we met with him we were impressed as his professionalism, music knowledge, creativity, and willingness to help and answer any and all questions we had for him. When the big day came, Ben was prepared with everything we had talked about, and did a fantastic job at the reception! All our guests had positive feedback as well! We would highly recommend Ben for your DJ services and hope to use him in the future for other events we have that may require a DJ! We used Create Excitement for our wedding on May 9, 2009. We had several special requests and the DJ delivered on every one. Our First dance song was At-Last / Sung by my niece Amanda Thompson, the DJ worked with us to make that an unforgettable performance. He also had an awesome mix of songs that kept the dance floor filled during the entire reception. From the youngest to the oldest, everyone is still talking about how the DJ always played the right songs at the right time! The DJ was very professional. He always kept our guests involved and was always ready for anything. We especially liked the way they handled our Anniversary Dance, my wife’s grandparents were the last couple standing after they just celebrated their 60th Wedding Anniversary! They also did an incredible job with our photo montage and their website was a huge help. I would recommend Create Excitement to anyone. Awesome tool for wedding planning! They were more thorough than I ever could have been picking my music! Their website is AMAZING ~ totally awesome tool for wedding planning. Reasonable prices and great communication~!